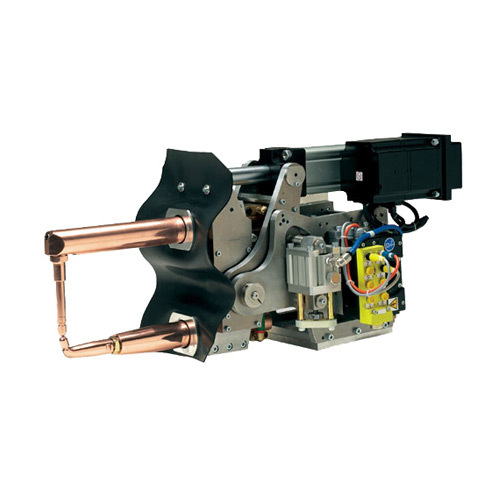 PWRWP has been manufacturing robot spot weld guns for over 30 years. Having supplied to automotive manufacturers as far afield as Mexico and South Africa, PW has established an enviable reputation for quality and service. Manufactured in Shanghai since 2010, PW robot guns are now predominantly servo driven, reflecting the large energy savings and cycle time gains this technology offers, when compared with pneumatically operated systems. The Shanghai factory operates to ISO9001 principles, with the thorough process control and testing expected by clients such as GM, to whom PW has supplied many hundreds of guns. The PW in house gun design facility remains in Europe, our design team having a combined 50+ years of resistance welding design experience. Programmable retract strokes cut robot cycle times. Soft approach removes electrode bounce and reduces weld cycle times giving further productivity gains. Energy savings can be as high as $1200- a year per gun when compared with compressed air. Electrode life improved due to reduced hammering. Minimises tip dress cycles. Higher forces with reduced gun weights. PW weld guns use ISO standard transformers, both AC and Medium Frequency DC, but with the design flexibility available, non-standard and larger transformers can be accommodated if needed. Electrode standards can be matched to user, industry or national requirements and all electrode arms are cold bent as required, maintaining operational life and rigidity.